We have been silent for 18 months. We decided to stand back and observe, and let other groups try to get the message of boar conservation across here in the Forest of Dean. We have busied ourselves with repairing gardens and showing people the boar. The FC keep upping boar numbers and cull targets, the press spread more hatred and fear, the councillors get duped by all of it. Yet what we are told in the press never seems to agree with what we see in the Forest of Dean. Here we will outline boar population dynamics again, because this appears to be gaining more momentum than ever since the FC published some outrageously deceptive figures from their so-called boar "census" of 2014 (more of which in the next post). The Forestry Commission (FC) has proved time and again that it has a unique take on wild boar population dynamics - often claiming a need to kill 80% yearly just to "stand still". This year's population figure of 819 and rising is brought once again to us by the FC who really hope no-one notices their deception and crass methodology. "....biologists have noted that boar are the only large ungulate in the world with the population dynamic of rodents." Animal population dynamics is complex, and elasticity is needed to account for variables such as food resources, loss of shelter, climate, predators and how each of these factors may biasedly affect the various ages of the boar (e.g. old versus young), etc. Some of the above variables are strongly limiting factors to population of boar (we have written about these previously), and for these reasons alone many animal populations do not keep increasing ad infinitum nor do they do so predictably. - Short-tailed Chinchilla, Prarie Dog, Jerboa, Mountain Beaver, to name a few? In fact 16% of the world's rodents are endangered. So using the phrase "population dynamic of rodents" to suggest a rapidly increasing population is blatant propaganda aimed only at your irrational fear, and would NEVER be used by a biologist. The FC's continual insistence of using childish propaganda and simplistic pseudoscience with a year-on-year multiplication of a boar population just doesn't hold true for wild boar in the Forest of Dean nor anywhere else in the UK or the world where boar are not farmed. Sadly the FC and a few vocal groups and individuals, including some councillors, present pseudoscience to their cult followers in order to satisfy an agenda. This agenda promotes the fear of wild animals, a mythological belief of the dangers of overpopulation, or anger at allowing animals to make a mess of the countryside as much as we do. The ultimate reason is to make money and enjoy blood-sports, with the lesser ranking cult leaders actually believing the myths from the cult elders, the FC and those wishing to set up shooting companies. "My arguments were based on an increasing population; the invasion of gardens, sports facilities and farms, and road traffic accidents." Facts: Population may be decreasing, gardens rarely get invaded, unprotected football fields have been nibbled a couple of times, and RTAs are low, much lower than sheep and deer. Recently we learn that wild boar in Sussex and Kent may be on the verge of eradication. Presumptive high reproduction rates and cull figures based upon breeding mythology is dangerous for boar welfare and survival. Now, even the hunters are questioning the maths. The problem is, the cults ignore the lack of evidence for exponential population growth in the Forest of Dean, going back to the now infamous boar release of November 2004. We need a more educated viewpoint, and in the absence of any real science being done by the FC, Friends of the Boar, who have intimate first-hand experience of how the boar have populated the Forest of Dean can offer at least some intelligent reasoning..
Firstly, doubling or trebling MUST account for a certain natural mortality. So even with a starting population of just 2 boars, we get terrific increases in numbers within 10 years if no deaths occurred (and individual boar do live for more than 10 years!). Starting with a population of a single male and female, and double to treble them each year for 10 years (between the original release in Nov 2004 until Nov 2014), then by 2014 there would have been between 2,048 (doubling) and 119,000 (trebling) wild boar living in the Forest of Dean if no hunting ever took place. Firstly we see a huge difference as to which factor we use to increase the yearly total, so we need to be more precise. We also get the image of fast breeding boars whichever above factor we use - even a doubling of numbers would result in the Forest of Dean becoming "over-run" if we were to do nothing. But death's do occur, either from natural processes, or at the hands of man. Let's look at a real example of what really happened to boar numbers to prove this paper game is dangerous. Nobody ever expands on the fact that no hunting occurred until March 2008 meaning that for over 3 years after the infamous release here in the Dean in 2004 (of 60 animals according to the FC in their management plan of 2011), no significant number of boars were killed by man. Boar were very hard to see between 2004 and 2008. We know that poachers were not successful, and farmers were the only ones shooting on the periphery of the Forest. But in 2008, the FC wished to hunt. 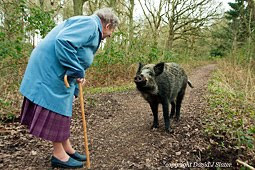 Residents were not making enough noise against the boar, despite efforts by the FC and other early cult leaders worrying the public about children being killed, giant hogzillas roaming the forest, and unprovoked aggression towards dogs. A figure of 90 boar was notified to the Council by the FC at a liaison meeting to determine a sustainable target population. They all agreed that this target was the population at that time - i.e. no more boar allowed than already present, as 90 seemed an acceptable number to keep. The cults, which include the FC at Bank House in Coleford, need to explain how you start with 60 animals, and end up with 90 after 3½ years. No boar were killed within the Forest of Dean in this time. This was the "real" world in 2008 and not some paper exercise! So we have a problem with the rodents. Surely after 3½ years of no culling, the cultists who promote a doubling to trebling of wild boar per year should be quoting a population of 700-3,000 wild boar in the Forest of Dean in 2008. Where did the extra boar go? Maybe they were secretly led off by the Pied Pipers of the FC? IF BOAR CAN ESCAPE, WHY WOULD THEY EVER OVER-POPULATE THE FOREST? Here's an issue the FC and other cult leaders never point out when they say things like "the boar have no natural predators, they need murdering, erm... managing", or "boar numbers increase like rodents". The Forest of Dean is a natural and open system and wild boars are at liberty to leave when things get crowded or food and shelter begins to dwindle. Fence the animals in, and artificially feed them in order to increase their individual fitness and lessen piglet mortality. They leave in parties of 10 to 40 each Autumn-Winter, maybe three or four parties a year, but certainly they do not leave in the thousands as imagined by newspaper editors and boar-haters. Wouldn't that be a sight! No need to watch wildebeest, come to the Forest of Dean for the Earth's greatest migration of land mammals! The number that actually leave annually account for about 20% of the population, or the number the Forest cannot sustain naturally. Can we find a population equation that is more realistic? What we need to know is the percentage of breeding females, the death rate of piglets, and the percentage of boar being killed plus those leaving the Forest. The first two factors are quite easy. From our long experience of boar, whenever you see a sounder (group) of boars, it's common to see that ~15-20% are breeding females. Typically, a sounder is something like 4 sows to 20 piglets + immatures + subordinate sows. Since females are rare outside of sounders and about 5-10% of the boar population are single males or bachelor groups, the population fraction for breeding sows is 10-15% of the overall number of boar. Those 20 piglets soon die off to 10, often within a month of birth, by natural predation. A loss of 50%, something we have observed every year for a decade. Natural predation may take the form of parasites, bacterial infections, hunger, cold or death by other boar. The loss factor is the biggest unknown and is likely to be variable each year - the percentage loss of boar emigrating out of the Forest or by man-made death such as traffic accidents, poaching and killing by the FC. We believe that figure to be about 20%, as already stated. But actually, given that the percentage of breeding sows and piglet death is fairly well known and doesn't vary by much (lest you disagree), the natural loss factor can be estimated from pre-2008 figures and extrapolated thereon to indicate if any boar at all need culling. Using observed piglet loss of 50% of a 6 piglet litter each year (the mean and mode of a piglet litter) and 15% of the population are breeding sows, we arrive at a more plausible population dynamic that would get us from 60 boars in 2004 to 117 boars in 2008 with no losses. Reducing that 117 by 20% gives us a figure of 94 for 2007 - a figure the FC agree with before the culling began in March 2008. Figures in brackets are those estimated by the FC. A 20% loss of the population would actually match nicely to many other observations, such as numbers seen within a group leaving the Forest, claims made to us by poachers and hunters, and road traffic statistics. This calculation makes a 16% yearly increase of boar. Here we have at least an observation matching a plausible theory! We get a STATIC population! No need to cull - the population remains the same due to loss by emigration, natural deaths and deaths on the road. We believe this happens once the maximum population density is reached at 3 or 4 boar per square kilometre. In the early days, the boar population was continuing to rise at 16% in order to populate the entire Forest. If they had been left alone without the hunting, the birth rate would have slowly fallen and/or the loss rate increased. Equilibrium may have been occurring about now, in 2014 with 265 boar living in the Forest (available forest area = 70 sqaure km), with about 60 leaving each year. The reduction in birth rate has been observed. We did observe a huge reduction in sows with piglets during the snowy winters of 2011 and 2012, either because sow fertility reduced or most of the piglets died. Was it due to the weather, or due to the forest ecosystem being full? Did the population within the Forest start to stabilise or reduce? We think so. But caution, when we have 2 or 3 variable non-independent coefficients in an iterative equation, the sensitivity of the result can be easily way off-course when just one of the variables is wrong. SO WHAT HAPPENED AFTER 2009? From our population growth above, 2009-2010 showed a significant change between predicted and observed, and more so if we use the FC estimates for those years. The population became suddenly perturbed towards higher numbers with lower ages. This neatly coincided with the start of culling by the FC. As we have repeatedly claimed, from around 2010, the population of boar became skewed towards younger and younger boar due to adults being shot and compensatory rebound giving rise to more piglets (see earlier posts for explanation). Due to propaganda by the FC that boar numbers were increasing rapidly above the agreed 90 in 2008, mismanagement of the boar began in earnest. Zealously the rangers began shooting every boar they saw in private, either for personal pleasure (at least for one ranger in our opinion) or to generate "meat sales" income for the FC at Bank House. This is the hunters dream and why large parts of Germany and Europe have boar problems. Indeed, the FC took advice from German hunters in the early days and still do today - advice of how to increase meat-sales and shooting revenue! You need to be VERY careful when listening to the rodent-folk so you are not being duped. From 2010 onwards, the natural system became distorted by hunting, with tame boars and piglets showing up due to orphaning of piglets before their mothers could teach them to run away from us. Sadly, no-one heeded our caution about over-zealous hunting, and the rapid cull of 100 boars in late 2012 (the FC applauded themselves) disrupted the balance once again. The FC's German advisers must have been thrilled. Calls to drastically cull reappeared that Autumn as the boar ran from the Forest and onto the verges again, much to the delight of the local press. This has been the pattern for the last few years. Inflated population estimates, and now the easily fudged pseudoscience of distance-sampling is rearing its ugly head (see the next post). So statistics need to be based upon observation and not on crude paper exercises to support the removal of boars. What we need is to stop the hunting within the Forest. Allow the natural balance to be restored back towards a density of 3-4 boar per square kilometre. We need baseline monitoring - as suggested by us in 2011 at the boar scrutiny meeting, but it was ignored. With 264 boar in the Forest, is this what the public can tolerate? What is the Cultural Carrying Capacity of the boar? No-one knows because the FC constantly propagandise and lie about population figures as well as disturb the natural boar behaviour. We have proposed on many occasions, that all of the killing of wild boar could be achieved by farmers as compensation for damages. In a well managed system, this could amount to as little as 50 boar per year, but is dependent upon the other environmental variables noted above. Rats and boar may have high birth rates compared to some mammals like deer or sheep. But animals with high birth rates do so because their death rate is high, not because they want to starve themselves or destroy their own environment. Animals do not like overcrowding and there are controls within their own natural dynamics to help. The boar, having been re-inroduced without proper scientific scrutiny, is a concern for all and what is needed is calm and rational behaviour. Birth-to-Loss ratios vary. In an empty forest, population rate of boar is about 16% higher than loss. As the forest fills, the Birth-to-Loss ratio reduces. In a full forest, loss rate equals that of birth rate. In an overpopulated forest, loss rate becomes higher than birth rate. We believe Nature finds the balance with minimal to no help from mankind. Yes, some species of wildlife may presently be overpopulated or underpopulated in Britain, but is it due to hunting and/or the long absence of boar....and wolf, lynx, elk, auroch, marten.....? Ecologically, things are also currently unbalanced within our heavily managed forest here in the Dean, constantly cleared for profit and rotated for re-planting. Old-fashioned conservation ideas also are no longer useful, proving to be ineffectual. We cannot play off one animal against another. Is a boar worth 2 adders or 200 ? How many frogs for a boar? Should the boar leave the frogs for the snakes to eat! How many goshawk are allowed to eat adders and slow-worms - or should we cull these endangered animals too? How about bringing back wolves to eat the boar? Then tackle other newt and frog eaters like hedgehog, heron, otter, fish? And when boar become endangered maybe the badgers can be blamed for everything - they're used to it! Remember, the most unbalancing and dangerous ecological force is man himself and his folly to play God. 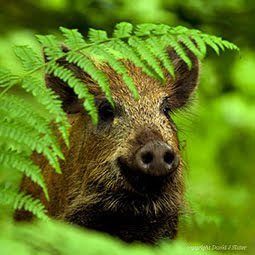 We see the introduction of wild boar to The Forest of Dean as a restoration of a damaged ecosystem and also a test. Can humans live with creatures like these? We believe there is a requirement for extroverted long-term thinking, not introverted and short-term vanity conservation or blood-sports. If one species begins to truly suffer due to the wild boar, then yes, something must be done, but it needs evidence rather than a pre-emptive strike. The resumption of heavy culling of boar will make even more boar next year. It will also hinder our knowledge of boar, their population dynamics, and their ecological relationship with this habitat and its animals including, of course, Man.